A few days ago Wizard Video made their "discovered" white-banner big box of Lucio Fulci's Zombie (1979) available (limited to 270, signed, unsigned, no idea). I immediately noticed something odd about the covers on their site. There seems to be a rectangular band of discoloration running up the left side of ol' Wormhead's rotted face. Why? My educated guess is that an original copy that at one point had a sticker across its front was utilized. The sticker was removed to reveal a slightly more colorful segment than the rest of the cover that was exposed to some sunlight during its lifetime. Scan! New box! Voila, warehouse find! I've made up a little unscientific comparison below. Number #1 is the scan of an original white-banner Zombie from VHSCollector.com which can be seen here. Disregard the obvious differences for now. Number #2 is the untouched flat cover image from Wizard VHS Collection's page. 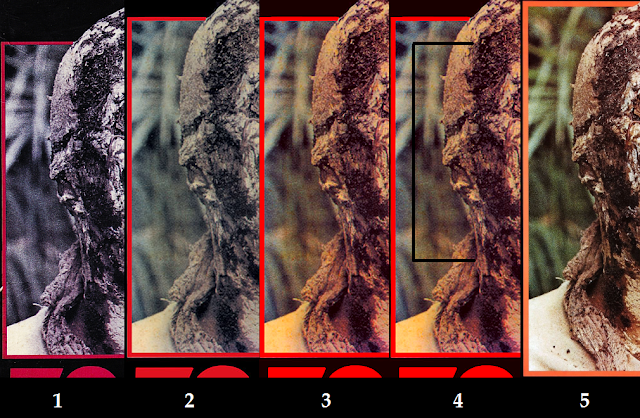 Number #3 is that image regraded to bring out the odd segment more. Number #4 indicates the outline of the "removed sticker" segment. Number #5 is the U.S. Theatrical one-sheet just for the hell of it. Back to #1; yes, it's very faded, but exhibits no such segment and would if originally present even in its poor condition. Also notice how the red outline on the original is thinner than the "new" Wizard. I'm still unsure why the top outline differs so much on the original despite matching the exact place to the zombie's head with the new big box. Hell, maybe the scale of the image on the new box is larger/skinnier? The new Wizard also has a small line/cease to the left of the zombie's ear rot that the original lacks. Bootleg? I'm unsure as I don't have this new big box and no one that I know has received one in the mail yet. It's just another interesting tidbit given the sticker shadow embedded on the cover of the new Headless Eyes (pointed out in VHSCollector.com's initial Wizard re-release video that began this brouhaha). Of course, as I've said before, at the end of the day this all won't matter. Band isn't going to change his story or admit to anything and his apologists will continue to shovel over big for repro imitations.